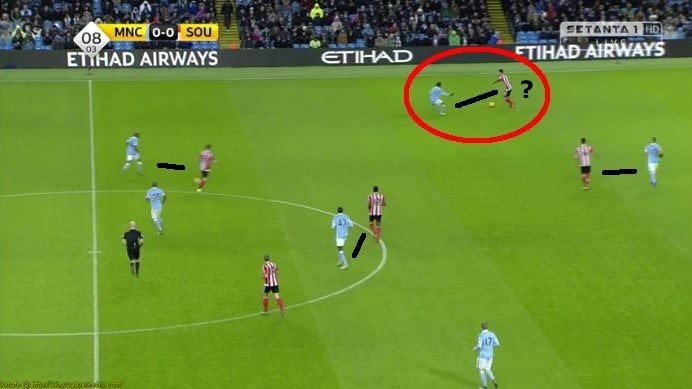 Ross Eaton writes a detailed tactical analysis of the Premier League match between Manchester City and Southampton, which ended 3-1. Manchester City: 13. Willy; 3. Sagna, 26. Demichellis, 30. Otamendi, 11. Kolarov; 25. Fernandinho, 18. Delph (Fernando, 69′), 42. Y. Toure; 17. De Bruyne, 7. Sterling (Silva, 74′), 10. Aguero (Bony, 63′). Southampton: 22. Stekelenburg; 3. Yoshida (Caulker, 35′), 6. Fonte, 17. van Dijk, 21, Bertrand; 12. Wanyama, 14. Romeu (Tadic, 45′); 10. Mane, 16. Ward-Prowse (Juanmi, 76′), 8. Davis; 7. Long. Manchester City lined-up in a 4-2-3-1/4-5-1 formation. Due to Joe Hart’s injury, Willy Caballero started in goals. Sagna was at right-back, in the middle of defence a pairing of Demichelis and Otamendi and at left-back, Aleksander Kolarov. As the main defensive midfielder was Fernandinho. Out of possession he was flanked by Fabian Delph and Yaya Toure, with Toure moving into more advanced positions in possession to form a 2-3 midfield. On the wings were De Bruyne and Sterling, while Sergio Agüero started up front. For Southampton, a 4-2-3-1 was again evident. Stekelenburg in goals, in front of him a back-four of Yoshida (due to first-choice right-back, Cedric Soares’ injury), Jose Fonte, Virgil van Dijk and Bertrand. One line ahead was a double 6, Victor Wanyama and Orioles Romeu. The three attacking midfielders were Mane, Ward-Prowse and Steve Davis. Graziano Pelle was suspended so Shane Long received his fourth start of the season, up front. For the majority of this season, if not all, we have seen City operate with a 2-1 central midfield, both in and out of possession. However, today we saw a change in their positional structure in the centre of midfield. City defended with a flat centre-midfield three of Yaya, Fernandinho and Delph. Yaya Toure played in a far more disciplined role than he has done in the past this season, and completed 3 tackles and 2 interceptions in his new defensive role, compared to his 1 tackle and 1 interception in last week’s defeat to Liverpool. In previous City games this season, we have Yaya play quite a passive role with one of the pivots rushing out of their position to press rather than the big Ivorian having to deviate too far from the central positions where he can cause danger in possession. This was quite an inefficient use of him in the defensive phase, and finally Pellegrini has made a change which should hopefully see Yaya make more a contribution defensively. In order to allow City to have a stable midfield (ideally) all of the time, more realistically some of the time, Delph and Toure would press the halfspaces and outer centre, with Fernandinho remaining as a 6. This wasn’t always possible though, as when Toure or Delph’s press was bypassed, this meant Fernandinho had to leave his anchorman position to fill the gap, this at time left a big gap around Zone 14. 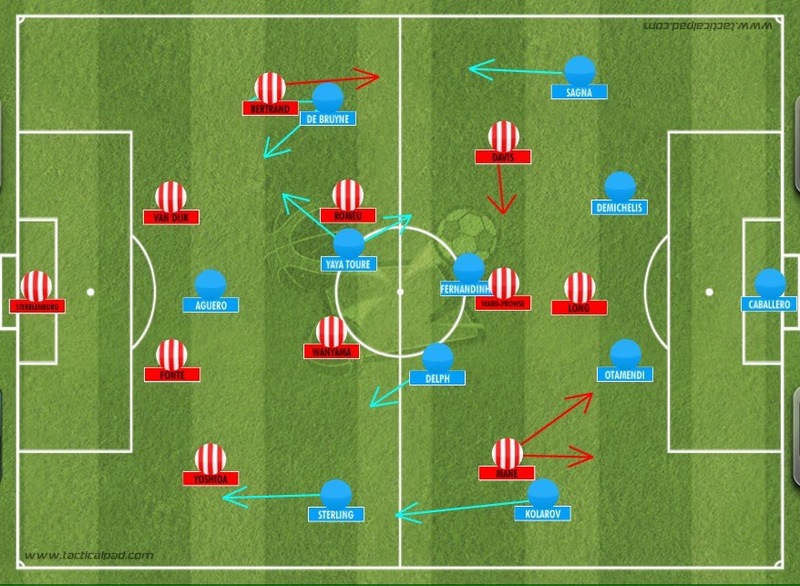 With City contesting the centre without possession, this forced Southampton play a more wing orientated game. However, with Maya Yoshida unable to offer much in the attacking sense down the right, this would leave Mane with no support if Southampton attacked the right, this meant they were forced to attack the left wing almost all the time and as a result became very predictable. In the first half, in an attempt to catch City on the break and exploit the space left in behind Kolarov due to his high positioning, Sadio Mane was instructed not to track back too far but instead remain in a positon where he could counter attack from. Mane was Saints’ most advanced player for far too long, both with and without possession. With Kolarov constantly bombing up the wing to support Sterling, surely Mane would get at least one opportunity to use on his pace and exploit the space, but it didn’t happen. City actually counterpressed very well and denied Southampton any space to launch a counter attack and have a smooth transition. There was a large problem with Mane’s positioning, the isolation of Yoshida against Sterling, and at times Kolarov too. Yoshida was destroyed for either pace or skill by Sterling all too often, and it was clear Sterling had qualitative superiority in these situations and Koeman was forced into changing this. Following the interval, Mane began to track back and aid Yoshida defensively. Mane defended the wing, attempting to stop crosses while Yoshida sat behind him and covered the halfspace. Injury to captain Vincent Kompany meant Nicolas Otamendi and Martin Demichelis were at the heart of the defence for City. With Otamendi know to charge at onrushing attackers with force and Demichelis known to lack concentration, some would say the pairing is a recipe for disaster…and they would be correct. At times we seen one centre-half charging at Southampton attackers with seemingly no sense of his defensive partner’s positioning. 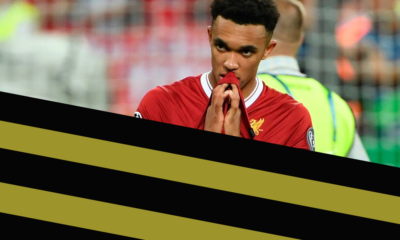 This caused a number of free kicks in dangerous areas, especially when the opposition have a player of the quality on set pieces such as James Ward-Prowse. Another common error from the pair was the gap they left between themselves. Shane Long took advantage of this a couple of times but was unable to capitalise any time. In previous matches a pattern of play we have seen from Southampton is Fonte or Van Dijk played a lofted pass to Pelle, Pelle then flicks it on to an onrushing midfielder (usually Sadio Mane). This pattern of play would’ve been perfect for this situation but unfortunately for Southampton, Long doesn’t have the same ability in the air as Pelle. If the big Italian was playing, he probably would’ve moved to the outer centre and flicked headers in between Otamendi and Demichelis, with Mane playing on his shoulder making runs onto his flick ons. Following a disappointing 1-0 loss in Turin midweek, City did well to earn a 3-1 victory a decent Southampton side. The absence of Graziano Pelle no doubt had a big impact on the game, as his aerial ability would have created far more opportunities than Saints were able to create without him. Sadio Mane seemed to be lost without having someone to link up with and compliment with his opposite attributes, particularly his pace. The alteration of Yaya Toure’s role is without a doubt a step forward for City, as his poor workrate was having a very negative impact on the side. In his new role however, Toure will be able to use his terrific ability to drive into space from deep as well as making a greater contribution defensively. One issue which will have to be addressed by Pellegrini is the loose compactness between defence and midfield as City’s opposition are getting far too much space in between the lines due to this. A player such as Mesut Özil or Phillipe Coutinho will fully take advantage of this against City unless the issue is sorted. Ross Eaton is a Scottish analyst looking to find a full-time career in football analysis. Ross is a believer in a short-passing but fast, attacking style of play, this would correctly suggest his favourite manager may be someone named Pep Guardiola. Take a look at Ross' personal blog at http://boxtoboxcentreback.wordpress.com/.